It comes from God and it is within your reach ... The applause of heaven. A joy that can't be quenched? A peace that can't be broken? A happiness that can't be threatened? There is such a joy. It is a sacred delight, a holy gladness. You can't open your Bible without reading about it. You can't live a truly satisfying life without it. And it's nearer than you think. Jesus describes that sacred delight in the astonishing mountain message we now call the Beatitudes. 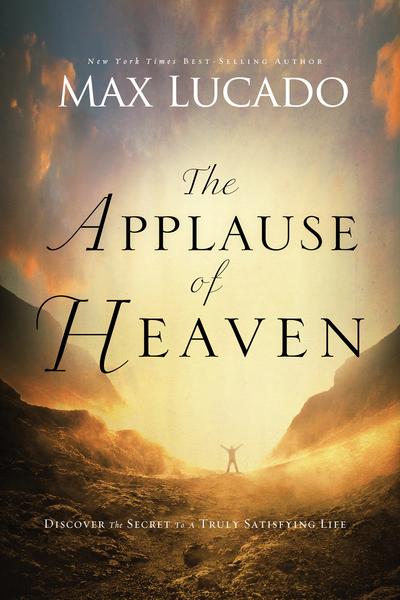 And Max Lucado, in this classic exploration of enduring joy, shows you how this familiar but revolutionary prescription for living can bless your life beyond your wildest imagining. Imagine God doing what gods would do only in your wildest dreams -- wearing diapers, riding donkeys, washing feet, dozing in storms -- dying for you mistakes. Imagine having God as your pinch-hitter, you lawyer, your dad, you biggest fan, and you best friend. Imagine having the King of kings in your cheering section and hearing the applause of heaven ring out ... just for you. But don't just imagine it. Open your heart to it -- the heavenly joy of knowing the God who delights in you.